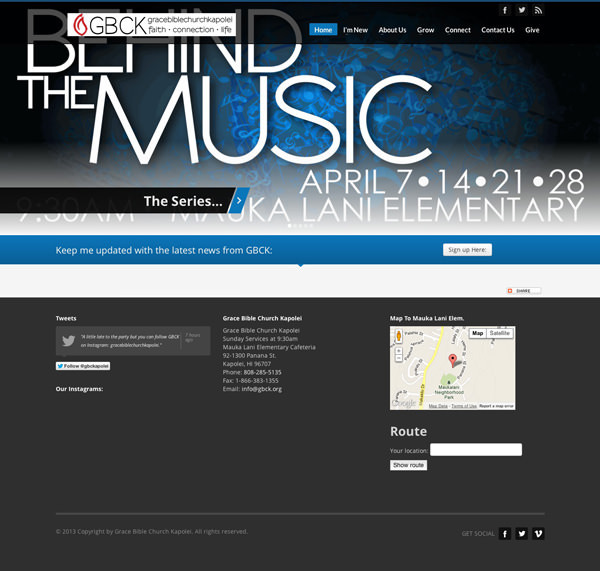 My good friends at Grace Bible Church Kapolei asked me to do a theme upgrade. They chose the theme they wanted from a theme company and I installed it for them. Their site had been hacked and was distributing Malware and WOT (Web of Trust) had flagged it as a bad site. So I removed all the malware, updated htaccess files, and did a lot of spring cleaning. Removing Malware is only the first step. You must also figure out how the malware got there in the first place. In this case, their website had tons of unused plugins, unused themes, and had not been updated for over two years. Talk about a hackers dream!!! So I removed themes which contained the dreaded timthumb script, and ran a bunch of updates. Plugin Conflicts- the next step in the process was resolving plugin conflicts. There were plugins which had depreciated functions from WordPress 2.0 Yikes!!! I removed and replaced a bunch of plugins with up to date secure plugins. Next step in Security is installing Firewalls and other security measures. I did this in the form of a couple of plugins which I love to use and recommend: Bulletproof Security, and WordFence. Once the foundations were in place, I could address the theme and putting together the homepage and contact page. That’s the easy part. My final step was to install a Speed Caching plugin which was recommended by their webhost. Once the recommended settings were implemented, their site was ready to go.